For years I’ve been asked by patients and friends about chronic ear infections in children. There have been several studies on the subject and all of it shows amazing promise. I’ve had the privilege of hearing Dr. Joan Fallon speak at many seminars. She’s an outstanding pediatric chiropractor from Yonkers, NY and an extremely intelligent, research-oriented physician. I recommend you read about a study regarding chiropractic treatment in children with ear infections here. I’ve also had her evaluate and treat my own son when he was a year old when he was suffering from an ear infection. Her approach was quite simple: treat and remove the subluxations. Children have the same anatomy as you and I, however there are a few striking differences. One of which is the fact that a baby’s head accounts for about 30% of their total weight up to the age of about 1 year old. That would be the equivalent of a 180 pound person with a 50 pound head! This is what accounts for a baby/child’s inability to fully control their heads. Secondly, and more importantly, the eustacean(YOO-sta-shin) tubes in children are short and have no descending angle toward the throat until the child is roughly 10 years old. The eustacean tubes are the pressure-equalizers between your ears and your throat. If you’ve ever gone up in a plane and had your ears “pop” when ascending or descending in flight, or if you’ve ever felt the need to yawn or chew gum to equalize ear pressure – what you’re trying to do is to manually open the tube and allow your middle ear’s pressure to equalize to your surrounding atmospheric pressure through your throat. 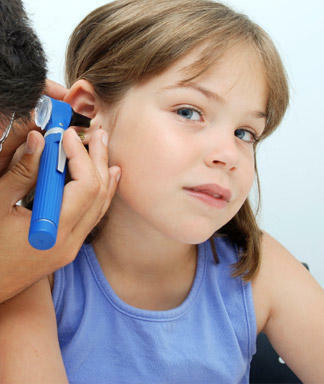 Ear infections in children are more frequent because of the anatomical factors mentioned above. Bacteria from the throat have an easier path traveling up the horizontal eustacean tubes than it does in adult counterparts who have angled ones. Couple that with the anatomically shorter path travel path and, viola! !…ear infections. Eustacean tubes also help keep the middle ear drained in the same fashion. It’s the function of these tubes that’s seen as the fault in cases of chronic ear infections, and also where chiropractic care seems to fill a niche and address this need. Chiropractic treatment for children requires time and patience. The benefits will be seen in time, and it has been noted in the research above that there was a definite reduction in the frequency of infections in children who underwent treatment. This also lead to a reduction in time spent on antibiotics, given the alarming side-effects they have. For a list of other articles regarding chiropractic treatment for ear infections(otitis media), click here. There is another phenomenon to be aware of: Fluid build-up. 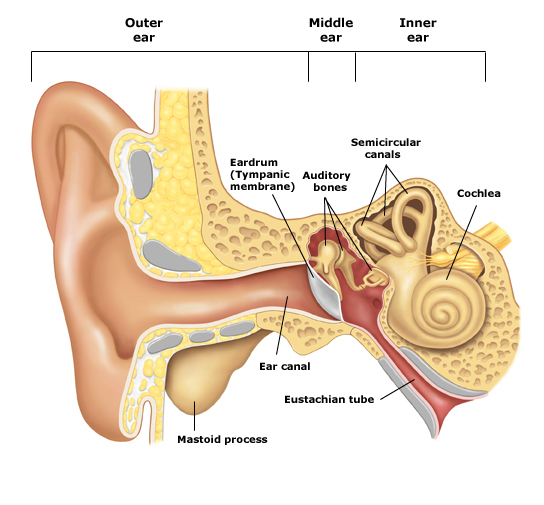 There is the possibility of fluid remaining in the middle ear, yet the ear doesn’t become infected. I’ve had one such case of this – where the fluid was moved but didn’t fully infect or drain. It’s important to have the child’s hearing checked periodically in conjunction with treatment. Should prolonged fluid persist behind the eardrum, the child may experience a reduction in hearing as well as delayed speech. In bad cases, surgically implanted tubes may be place in the eardrums to assist in the draining process, but it’s always best to exhaust all other means first. Surgery is – and always should be – a last resort, and I have yet to meet a parent who didn’t express serious concerns about surgery…especially for their child.